All ESA Annual Meeting proposal and abstract deadlines are 5:00 PM Eastern so that technical support and ESA staff assistance will be immediately available when submitters need it. If you begin your submission very close to the deadline, you are choosing to take a risk, and we will not make an exception if you don’t complete your submission in time. The form automatically closes at 5:00 EST / 2:00 PST whether you have completed your submission or not. We invite proposals for organized oral sessions for the 2018 ESA Annual Meeting. Organized oral sessions are organized around a specific topic with 10 speakers invited by the organizer at the proposal stage. These sessions are distinguished from symposia in that there is less emphasis on breadth of appeal and overall synthesis. Unlike symposia, a strong organized oral session proposal may be comprised largely of related case studies. Proposals are encouraged to address the meeting theme, “Extreme events, ecosystem resilience and human well-being,” if appropriate, but doing so is not necessary. Any timely and coherent subject of broad ecological interest will be considered. We also welcome proposals that explore interdisciplinary connections with areas of social and natural science outside of ecology or that relate to ecological education at any level. An organized oral session runs for 3.5 hours and consists of 10 talks, each 20 minutes in length. Unlike symposia, organized oral sessions do not have a period devoted to discussion. Proposals listing more or fewer than 10 confirmed speakers will not be considered. Co-organizers (Name, institution, and email for each). Moderator (Name, institution, email). The moderator may not serve as a speaker in this session. The organizer or co-organizer may serve as moderator. 10 Speakers (Name, institution, email, and tentative talk title for each). Only speakers who have been contacted and have committed to the session should be listed. Session description (< 400 words): Should focus on the theme of the session. May include background information, goals, objectives, importance, and interest to the membership of ESA. The description should avoid overly specialized language. Any ecologist attending the meeting should be able to understand it. It will appear in the online program and be read by attendees deciding whether or not to attend the session. One sentence session summary (< 50 words): This is a very short version of the session description. It will appear in the print program and be read by attendees deciding whether or not to attend the session. All proposals will be peer reviewed and scored by reviewers selected by the ESA Program Committee. The Program Committee may accept, decline, or offer an opportunity to present the proposed work in a more appropriate format (organized poster session, workshop, or special session). Session organizers will be notified of decisions by December 7, 2018. Proposals will be assessed using the following criteria. The weight of particular criteria may vary depending on the nature of proposals. features significant contributions to or advances in ecological understanding. presents innovative and original work. forms a coherent whole through contributions from individual talks. offers a range of perspectives through the collection of speakers. avoids the appearance of biases toward their organizers’ own perspectives. lists 10 confirmed speakers (speakers who have been contacted and have committed to the session). includes a specific title for every speaker’s talk. offers a diverse mix of speakers, each of whom brings new contributions to the session. If a proposal is accepted as a session, it is very important that the organizer communicates with speakers between December and August about the acceptance status of the session, the confirmation status of speakers, abstract requirements and deadlines, session scheduling information, and expectations for participation in the conference. Here are a few details that all speakers should know up front. Miscommunication about them can disrupt session planning later in the process. We are unable to honor scheduling requests. When asking speakers to commit to the session, organizers should inform them that the session could be scheduled any day Monday through Friday. We cannot schedule or move a session to accommodate the availability of speakers. Speakers who fail to submit an abstract on time will be removed from the session. It is the responsibility of the session organizer to make sure each speaker submits an abstract for his/her talk using the unique link that will be emailed to each speaker in early February. It is important to make sure all of your speakers are aware of the abstract submission deadline early on. All speakers are required to register for the conference. Registration will not be waived or reduced for any speaker. We greatly appreciate the contributions of invited speakers, but due to the number of organized sessions, we typically invite over 800 speakers each year. ESA is not able to provide any financial assistance, stipends, waived or reduced registration, travel assistance, or paid lodging to speakers. Organizers are responsible for making this clear to their speakers early on when it is easier to replace speakers. Once an organized oral session has been accepted and listed online, cancellation imposes a serious burden. Do not submit a proposal if you are uncertain that you will be able to fulfill your obligation to organize and conduct the session. 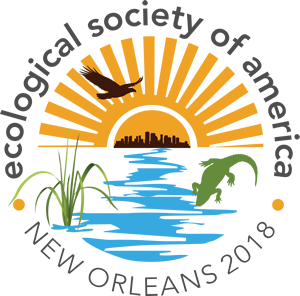 Once a session is accepted by the Program Chair, cancellation by the session organizers will preclude the organizers from being allowed to submit any proposals for sessions for the 2019 ESA Annual Meeting. September 14, 2017 Deadline for submitting a proposal to ESA. December 7, 2017 Notification of acceptance sent to organizer. January 8, 2018 Deadline to submit session revisions and reaffirm speaker lists. February 8, 2018 Notification of scheduling (session date and time) sent to organizer. February 22, 2018 Deadline for speakers to submit abstracts.